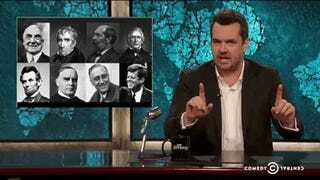 My favorite current late-night show host is Jim Jefferies. He’s in the mix with Samantha Bee, John Oliver, Stephen Colbert, et. al. on breaking down the insane onslaught of political news in the United States and making it funny, all while mixing in his outsider’s point of view. Jefferies has done a fantastic job with every episode so far, though his choice of weatherman* may be questionable. In fact, “The Jim Jefferies Show” just got picked up for 10 more episodes by Comedy Central! Jim heads to Comic-Con to find out where cosplayers stand on political issues. Ever since the airing of the two seasons of “Legit”, an FX show in which Jefferies explores his personal identity as a comedian living in a country halfway around the world, spending his everyday life in the company of two American brothers, one of whom is legit disabled, I’ve loved this man’s work. “Legit” is the first and best show out there for adults that portrays what it’s like living life as a disabled adult (or with a disabled adult) with friends and not a lot of money. It’s awesome. Go check it out. 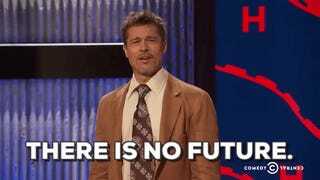 And Jefferies new satirical news show on Comedy Central is just as amazing too. He combines his sense of humor with his intelligence, his ability to read, learn, and formulate his own informed opinions (unlike a certain POTUS), and on top of that, we also get his outsider sensibilities on American politics as he is Australian-born. “The Jim Jefferies Show” just received an order for ten more episodes this week, and he surely deserves it after a blazing first seven episodes. As he demurs on last night’s episode: “I may end up doing this until I $&%^ing die.” That’s not a bad thing for the rest of us. I don’t know where else. Because the intellect and courage behind this rival those of Colbert’s, Bee’s, and Oliver’s. I highly recommend watching the previously-aired episodes (though they are topical to the issues that particular week while combined with a field piece, as is the format of most episodes), but I also recommend just jumping right in with his regular new episodes every night at 10:30 pm EST on Tuesday nights. You won’t be sorry. While he may have good looks, his outlook is a little bit... gloomy.